Check out my reviews of The Star Wars #1 and The Star Wars #2. 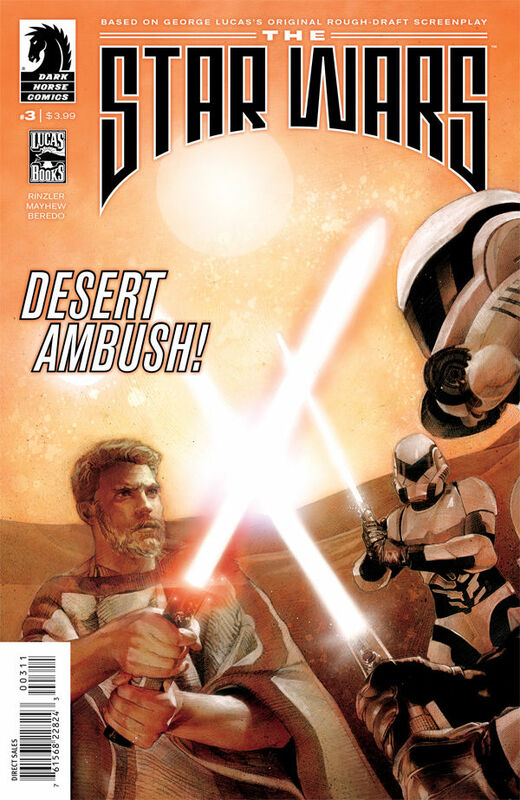 The Star Wars #3 by Dark Horse Comics picks up where The Star Wars #2 left off in this comic adaptation of the original screenplay by George Lucas. What’s most interesting about this series is seeing what the characters we know and love/hate were originally supposed to be and look like. It’s also much more violent in some ways than the films, so I’m enjoying the action-packed nature of the story. As for the main character, Annikin, I find him as completely unlikable as he was in the new trilogy. He’s nicer to strange robots than he is to Princess Leia. I still can’t really get over him knocking her out, so that may have something to do with my inability to understand whether he’s supposed to be good or evil right now. This is worth picking up for Star Wars fans who are looking for something new and different in the Star Wars galaxy!